When you fill up a normal ICE car you know exactly what your costs are for the fuel. With an electric vehicle it is not that simple. There is a charging efficiency factor that comes into play which means that that energy that your car may be telling you that it used could be quite a bit lower than your actual usage. A while back I wrote about installing an EKM Digital Submeter on my NEMA 14-50 outlet to measure actual power usage of the Model S so I could compare that to the reported power used. I had just had the meter installed and collected some initial data about the charging efficiency based on a very short interval. Now I have more data and the loss is larger than I originally expected. 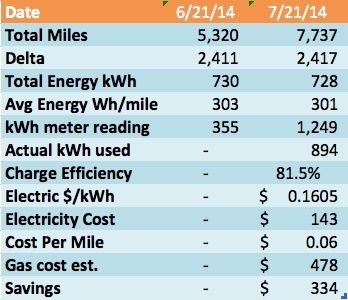 Model S charging efficiency is worse than you may think. I charge at home 99% of the time. So far in 3 months, 7,500+ miles i’ve only used a SuperCharger once and a HPWC (at the Tesla store) twice. At home I have a NEMA 14-50 outlet installed by a licensed electrician. I’m using the factory supplied mobile connector as the connector/cable between the outlet and the car. Added to that outlet is an EKM digital sub meter to measure actual draw from the outlet. That meter is accurate to within 1% and does not add any measurable load of its own. On the “anniversary date” of taking delivery of my Model S I record a bunch of pertinent information and then reset the Trip A setting. Before driving the next day I record the reading on the EKM meter. That way i’ve got the mileage and the Tesla reported power usage over the period driven and the the actual kWh used to get back to the original charge state (90% for me). I plan on using this information to look at how average energy used changes as the months/temperature changes and perhaps as the Model S gets more miles on it. Unrelated specifically to the car, but useful in other analysis is my current “all in” cost per kWh from my electric company and the current local gas price i’d be paying if I had purchased another Acura. Those will both change over time too. While I don’t drive consistently on any given day (test drives, special trips and the like), the numbers will average out and my driving style is not likely to change much after over 30 years of driving (yeah i’m getting old but the Model S makes me feel young again!). I also drive pretty consistent patterns of commuting with a lot of miles to the same places which helps average out the special trips to locations with different terrain/conditions. Basically, while the conditions aren’t perfectly stable over time, the averages and data from this real world testing will be pretty accurate. The last period (6/21 – 7/21) was my first full period with both the car and the EKM meter. A month of driving and charging, especially with the miles and kWh’s involved is a decent period over which to look at the results versus the 2 days from my prior blog post. In the above table you can see that the Model S reported 728 kWh used during the period but the meter reported 894 kWh used. This means my charging efficiency is only about 82% and electric usage (and cost) is 23% higher than I may have expected based on the readings the Model S provides. For that month this is an extra $26 of charging cost which is a small number but a decent percentage of the total. The good news is that even using this larger kWh number, the savings versus driving my old ICE car for energy alone comes in at $334 — i’m saving $334/month in gas driving my Model S! My electric cost is 23% higher than I may have expected based on the readings the Model S provides, but i’m saving $334/month in gas driving my Model S! External research indicates that an average charging efficiency loss in the industry is in the 10-12% range. In the forums of the other EV vendors there are people doing a similar analysis and getting charging efficiencies close to 90% (10% loss) on both the Nissan Leaf and the Chevy Volt. Consumer reports also did a study on the Nissan Leaf and reported 85% efficiency although that test was short term and possibly flawed from that. Over this one month period of over 2,400 miles i’m seeing an 23% loss using the standard home charging setup that Tesla recommends. Many people quote an 85% charge efficiency for Tesla, and Tesla’s own charging calculator appears to assume a 91% charging efficiency which is quite different than the 82% actual charge efficiency i’ve measured and significantly worse than the average industry charging efficiency. It would be great to see a Model S owner do a similar test with a HPWC setup at home to see if that HPWC is somehow more efficient (it likely is) and gives results closer to what Tesla is providing. I’d love to do the test but i’m not quite ready to shell out $1,200 plus electrician costs to get that data — assuming a cost of about $3,000 all in it would take me over 20 years to break even assuming the HPWC improves my efficiency by 10%. From the results above, my conclusion is that the Model S charging efficiency using the standard home setup is 5-10% worse than other EVs on the market. Model S charging efficiency is 5-10% worse than other EVs on the market. Does Tesla have better battery technology, or is this just a battle of size? More to come on that front. Interesting data. Have you compared charging efficiency at lower amperage? Or while charging to a lower percentage, say 75%? Also, can you explain about installing the meter? It looks like it has to be connected to the wiring before the NEMA 14-50 outlet. I havent played with the amperage too much or lowering the charge target as I need close to a 90% charge these days in the winter and a lower amperage cuts it close in getting it fully charged. Perhaps in the summer time. Does the Tesla reported energy use include cooling or heating the battery? Yes, when you’re using it (its “on”) but it doesnt count any usage due to pre-conditioning, power consumed during charging, etc. Note that that won’t count when you use power from other sources (destination chargers, superchargers etc, but then you’re not likely paying for those). So no, the Tesla is not reporting all energy used that came in via the charge port. If you want to see that use the meter approach. So, if I understand what you’re saying: your measured efficiency is dependent on ambient temperature. I believe that’s what I saw using CHAdeMO. So, your efficiency might agree with Tesla’s at the optimal temperature. That could be as at the optimal temperature there’d maybe be no battery pre-conditioning. There is loss at the plug though. Also the data in this post were from the summer months in MA which are pretty close to the optimal temperatures. Sorry, I don’t understand “it doesn’t count…power consumed during charging”. Also, “when your using it” does that mean when I’ve turned on the HVAC? To be clear: I’m asking if Tesla is reporting all of the energy entering the charge port? I have seen the charge port light flash when charging is not occurring so current is flowing but is it reported. I saw a 10% efficiency loss using a CHAdeMO charger. The supplier, Greenlots, reported a lot more energy used than Tesla did. The charger in the car is most efficient at it’s max rating (11kW). Charging at 11 kW was 92% efficient. Charing at 4 kW was 83% efficient. Was the voltage the same? Another dynamic is that not all the power goes into the battery: If you’re in a hot or cold environment, the car will be consuming electricity to regulate the temperature of the battery pack … and that parked consumption doesn’t show up on the driving consumption, especially if it’s plugged in. Of course you should plug it in, because protecting the life of your battery is a sensible investment. The measurements and calculations are all fine. My concern is the leading claim that you know the exact cost for gas when you fill up. What you don’t see there are the higher taxes you pay for oil company tax breaks, higher taxes to fund military ops in the Middle East to keep the oil flowing or the 6,000 American lives lost while fighting there. We’ve never fought a war for electricity, which makes the Tesla power supply a bargain no matter what the meter says. I definitely appreciate and support our troops and would love my country to be more self-sufficient but its hard to factor calculations along those lines into analysis like this. The summary is that while it costs more than you think to drive the Model S its still a good savings over an ICE vehicle and as you point out has other significant benefits too. Interesting data, and lots to say about it. Before I make my main points, I’ll note that I own a Think City EV. This is a Ford-designed EV with a 24 kWh battery. The company went bankrupt in 2012, which enabled me to get a very good closeout price on a fun little urban runabout that averages 307 watt hours per mile. The worst winter day in Seattle since purchase was 401 watt hours/mile, and the best summer day was 250 watt hours/mile. Thinks don’t come with an electricity use meter, so I bought a Watts Up meter that measures the output from the 240v circuit that powers my Level 2 charger, which is rated at 20 amps but runs at 14 amps in use. It doesn’t surprise me one bit that Tesla’s meter omits charging losses. This is the same as Nissan’s star-crossed “Carwings” data, which are equially useless. The numbers you reported bring your Tesla Model S very close to the consumption reported by the EPA. The only quibble I’d have is at the conceptual level. I really don’t think anyone who plunks down $100,000 or thereabouts for a Tesla Model S ever actually cared how much it costs, and that could include the fuel. My Think’s average fuel cost is 3.6 cents/mile. If I paid your electric rates, it’d be 4.9 cents/mile. I did have to chuckle at a few of the responses that seemed to go to great lengths to back away from your factual account. EVangelism raises its head everywhere. Thanks. Im not sure you can say nobody who pays that much for the car doesnt care about the costs of electric etc. I paid but do care (well at least I monitor it, but I still pay the bill). Good thoughts, for the most part I think all chargers not at a destination other than superchargers for my Model S are totally useless — That EV charger at the grocery store? Not worth plugging into. But, my Model S is my car and I drive it everywhere. 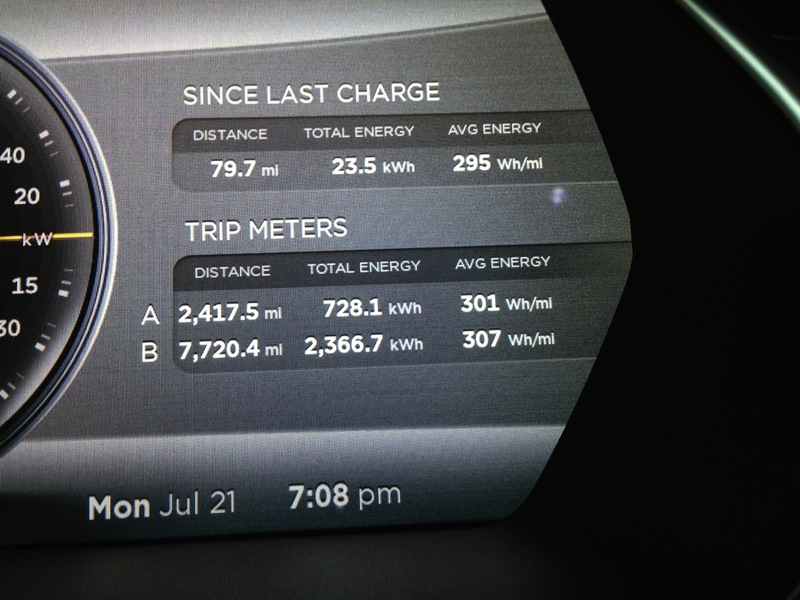 Recently that has been a lot of long trips of 350 miles each way including at least 2 supercharger stops. While not nearly as fast as some would make out, they are very workable for road trips and I have many trips under my belt. There are strategies to making them work well though and the Tesla software isn’t good enough to help all the way with that yet. I guess it would be a matter of what “care” means. I “care” enough about the costs of the electricity for my EV to measure everything, but it’s really a matter of being a data nerd as opposed to caring about the impact on my budget. Same goes for my other vehicle, a one-ton pickup that gets about 16 mpg. It costs 23 cents a mile for the fuel, but I can’t say I “care” about it other than as a curiosity. Anyway, I salute you for putting the numbers out there. I can’t tell you how many times I’ve run into EVangelists on the Internet who make outlandish claims of various kinds. This is irritating or amusing, depending on my mood, but some of the claims amount to magical thinking — and then are followed by proposals based on that magical thinking. I often see postings from EVangelists who agitate for a lot more public chargers. They ignore the fact that the federally subsidized Ecototality, which ran the “Blink” chargers, went bankrupt for lack of use. Just try to point out to any of these people that public chargers mark up the cost of the electricity double or triple or more — and are incredibly slow, including Tesla’s “superchargers.” You’ll get called every name in the book. Once that’s pointed out, then we hear the arguments to the effect that everyone is happy to cool their heels for an hour every 150 to 200 miles — and that they typically make such stops anyway in a gas vehicle. Which of course isn’t true. Nor is it true that a Tesla is an acceptable road trip car. Oh boy, say something like that, and you’d think you were the CEO of Exxonmobil. So, in any case, keep telling it like it is. Someone has to. My middle name could be “road trip.” This is a subject I know a great deal about, from personal experience. I have drive about 300,000 road trip miles (i.e. apart from ordinary commuting or other in-city trips), in all 50 states plus a bunch of European countries. You can recharge those cars in 40 minutes at a supercharger, vs 2 or 3 minutes at a gas pump. Putting aside the absurdity that people will somehow accept this on a mass scale, I’d point out that even the superchargers are few and far between. In practical terms, a road trip traveler is lucky to find a 240v/30 amp electric dryer hookup. If it’s at a hotel, good luck getting the manager to agree to allow a 200-foot extension cord. If it’s at a B&B, chances are even slimmer. And how many people carry a portable 240v/30 amp rated unit, anyway? But, just for grins, let’s imagine that iour traveler did that, and was able to charge at 6 kWh/hr — heroic, in my opinion, but I’ll tilt this toward the EV. If so, we’re talking about 20 miles of range per hour of charging. In practice, this means to get 200 miles of range, you plug the 84 kWh sled into a electric dryer circuit overnight. Where I travel, this just doesn’t cut it — even if it was available. The bottom line, to me, is that as much as I like my little EV, these cars are far behind the 1952 Chevy when it comes to their all-around capability. When you then include the substantial price premium and reduced resale values, I don’t see EVs being mainstream for quite some time. If you plan ahead you wouldn’t need a bunch of that B&B charging etc but if you’re not inclined to try or think about it, its definitely easier to drive a gas car for road trips. For daily driving i’d argue the EV is easier since its full every day when I leave the house. Thanks for the comments and the feedback. I did take it all in a positive way and I completely avoid flame wars. Most of the time my trips are all about the destination and not the journey and the side roads often add a lot more time. You can definitely see a lot more interesting things and enjoy the journey more that way. Some EV people have also used it to improve their mileage as you’re generally going less than highway speeds and there’s less wind resistance. Practically the stops are more like 20-25 minutes every 180 miles or so. The trick is to only charge enough to get to the next one with a reasonable buffer. Thats a break about every 2.5 hours of driving. At the destination, generally I dont clock a lot of miles so they dont make a lot of difference for just popping around the area. Recently that included going up and down a mountain. It definitely takes some planning and thought but i’ve had no temptation to go back to one of my ICE cars except for that Pittsburgh trip. Thanks again for the comments and thoughts. I had seen that post before, then went and look at it again when you linked here. Before I comment, I’d like to say that I consider this a friendly exchange. I think you do too, but this being the Internet and the Internet being infamous for flame wars, I thought it might be best to say. I’ve been voicing a bit of disagreement at times, but it’s entirely respectful on my part. I give you lots of credit for your balanced approach to EVs. Concerning your “trip refused” to Pennsylvania, I’d note a couple things. One is that it would’ve been an Interstate highway drive. I use Interstates for only about half my road trip miles. The other half is on two-lane state and local roads, including some gravel or even dirt. In these places, even those (to me) intolerably slow superchargers will not be found for decades. I doubt that Fossil or Frenchglen, Oregon will have so much as a DC charger in 25 years. Thus, it is likely that I’ll never drive an EV to either place, or to Eastern Oregon. Or Idaho, Nevada, Wyoming, or Montana. In your case, the supercharger route would’ve lengthened your trip by nearly 50% and taken you on a route part of which is quite unpleasant (I lived in the East and did a fair amount of driving there, so I’m familiar). I don’t blame the family for their thumbs-down. Even if you’d been able to take a more direct route, you’d have to stop for 45 minutes every 175 miles — and more than that if the spacing of the chargers wasn’t optimal. Re-charging itself would’ve constituted about one-fifth of your trip time, which is far more than with gasoline. Sitting around at superchargers has to get old. The other thing to point out is that, when people take trips, they usually do a fair amount of driving right near their destination. And if that destination doesn’t have a supercharger, it can be quite inconvenient, and require a level of planning that might lead someone to ask if the car is transport or itself the object of the trip. I think EV owners go through a “wow, isn’t this cool” phase during which they are so thrilled that the obstacles almost become attractions — badges of honor, if you will. I can understand that, but when I look at EVs I look at them as cars like any other. They either do what I need them to, or not. Anyway, keep on writing. I’ve enjoyed your refreshingly honest accounts. Practically the stops are more like 20-25 minutes every 180 miles or so. You sure about that? The links below from two different Tesla forums says the best-case scenario is 45 minutes for 185 miles worth (which matches what I recall reading from Tesla itself). And apparently the charging speed varies considerably depending on how far you’ve discharged the battery. To upload 185 worth of range in a comparable gas vehicle would take less than 2 minutes at the pump. It reminds me of when I worked in Boston and moved from the city to the suburbs, and then moved to a different suburb. People at the office would quote ridiculously short commute times, so I decided that I’d look at my watch when I left the garage door (or front door, for those commutes where I could walk to a train), and measure it to the office door. Turned out that one of the suburban commutes, at 35 minutes, was 5 to 10 minutes shorter than either city commute. The other suburban commute was a real bear, ranging from 1:15 to 1:45 each way. The house was in a drop-dead beautiful place, but that commute was just soul-crushing, especially in the evening. Back to Tesla road trips. The other thing that comes to mind is that, if we’re talking Interstate road trips here, the whole stopping regimen changes. I know it does for me when I use the Interstates. We’ll hit a rest stop directly off of I-5 or I-90 or I-84, and spend 15 minutes every three hours or so. That’s typical, anyway. But there have been plenty of times where we’ve gotten into the truck and cranked out 350 miles at a stretch. Gas stops are few and far between: Once every 400 to 450 miles, and rarely more than 10 minutes — basically, however long it takes to wash the windows. We’ve occasionally combined a rest stop with a gas stop, but not usually because gas stations are rarely good places to walk the dog and smoke a cigar. And that would be Interstates. On the non-Interstates, it all changes, as I indicated previously. If someone’s road trips were Interstate only and they were willing to do the range-anxiety/frequent stop dance, yes, it would be possible. Again, thanks for the dialogue. In the EV world, I often feel like Diogenes in search of the honest car EV owner. It really depends on a whole lot of things like starting state of charge, how the supercharger is doing that day, if there’s someone right next to you (A/B chargers), the temperature outside as well as of the pack etc. For my use I tend to do the things I want to do and go back to the car and unplug and go. Sometimes thats 20-25 minutes, sometimes its longer if I get food. Its hard to eat a meal (even fast food) and get back and not have enough charge to get to the next charger in my areas. I should note that there are quite a few chargers along the routes i’ve been doing recently so I pick different routes/chargers just to check them out. I guess, the question is if you’re happy with what you have, why look at EVs? I didnt get mine to go green, or due to my concern over the use of oil, or because I thought they’d be easier to drive. Driving 100 miles a day commuting can be really boring and it was something new, high tech, and interesting. So it was a novelty that also could work with my lifestyle. Im still amused by it (as you can see in my posts!) but not quite the fanboy that some others seem to be. I write about the good and bad from my point of view and don’t expect everyone to agree. Is it perfect or completely practical? No. But its really cool and it is a decent car. And, for the most part, it can work for many people (barring the insane cost). But for many it won’t. People who live in apartments, cities, etc its difficult. Real travelers who want freedom? Probably not. I think we’re still many years away from something that can match the refilling speed of an ICE car. The range may climb but the charge rates need some serious breakthroughs or we have to go with something other than electric which has its own challenges in infrastructure etc. What about regen power added to the battery while braking? This will definitely influence the final kWh used by the car, and will ultimately decrease the kWh number shown by the car compared to what your EKM meter has registered. Thats true that it will make the number on the Model S less, but ultimately the Model S reports a lot less power use than what the wall meter reports. In theory that regenerative braking would only help it need less power. My point mostly is that you shouldn’t trust the usage information in the Tesla to know what your Model S is drawing in terms of power. It gets more difficult if you mix in destination and superchargers but at least for what you pay for the best approach is an independent meter. Interesting, but how does this account for the roughly 1% battery drain per day which apparently occurs on all Model S cars when parked? I don’t believe that is reported by the car’s systems for the kWh used per mile, so it may be artificially making your charger seem less efficient. Did you take that into account? Sure, that sort of goes back to the title of the post – “Driving the Model S costs you more than you think” — all these things consume energy. The only way to know for sure what you’re paying for is to put a meter at the wall. Great work. I’ve started charging my Tesla at 20 amps, instead of 40, thinking the slower charge is easier on the batteries. But is it more efficient? Inquiring minds would love you to test different charging amps. lol, good idea. I’ll add it to my list. from the battery after discharge. cycle is going to have ~82% efficiency (0.91×0.9×100). exact figure, anyway it doesn’t really matter. Definitely true, thanks for pointing that out.